Engine 7100 crosses Poplar Creek as it enters the K-25 plant. 7100 leaves the secure area of K-25 and prepares to pass Watts Bar Lake. A view across the pond at K-25. The freight train exits the woods surrounding Watts Bar Lake near the end of the rail line. 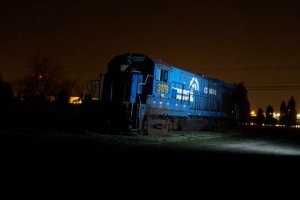 K&T 102 switches freight at Stearns, Kentucky. 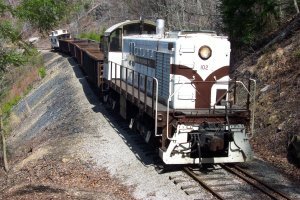 K&T 102 runs around the freight at the restored mining town of Barthell, Kentucky. The freight train performs a runby on the bridge heading in to Blue Heron Mining Camp. The route of the K&T runs alongside the deep, roaring gorges of Paunch Creek. Engine 102 performs a runby at one such location. Engine 102 enters the tunnel on the K&T. Then it exits the tunnel for another runby. 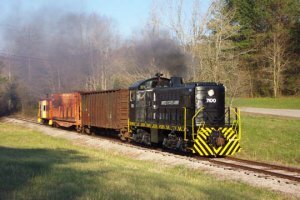 On April 7, 2002, the Southern Appalachia Railway Museum operated a charter freight train for photographers over the former Kentucky & Tennessee Railroad in Stearns, Kentucky. The line is now operated by the Big South Fork Scenic Railway (call 1-800-GO-ALONG for information). 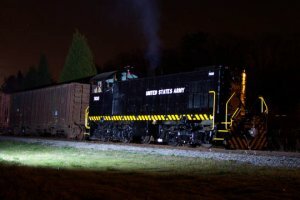 The train used K&T S-2 number 102, four gondolas, and the K&T caboose. All photos this page by John D. Browning unless otherwise indicated.